Ashan Silva stamped his supremacy at Eliyakanda for the fourth consecutive year by a faster timing of four milli-seconds. Shafraz Junaid was the fastest rider of the day. The Southern Motor Sports Club vibrated Matara with the sonorous roar of cars and motor cycles on the 23rd and 24th of February with the 17th Eliyakanda hill Climb and the inaugural Southern Drag Races. The festival of motor sports commenced with the Southern Drag Race 2013 on a 400 meter straight track along beach road Matara. New to the spectators in the south, the ’Drag’ was a treat to watch. The drag races were sponsored by US Car Sales and attracted over 50participants. Shirendra Lawrence, Andrew Choksy, Maduranga Caldera, Ananda Wedisinghe, Janaka Dinesh, Janaka Thillakaratne, Mahendra Fernando, Janith Kumarage, Rajith Uluwita, Chamika Ranathunga and Sudath Weerasinghe thrilled the crowds with their driving and riding skill. The Southern Eliyakanda Hill Climb attracted a record 150 competitors and was jointly sponsored by Pan Asia Bank and CEAT. Etisalat and Wurth were co-sponsors. Junaid was also adjudged the ‘fastest rider of the day’. Two other riders who thrilled the crowds were Sudath Weerasinghe and Maduranga Caldera. Of the motor car events, the Nissan March event (SL-N production cars up to & including 1000 CC), Ford Laser Events (both 1300 & 1500 CC) and the Honda VTEC event (SL-H cars up to 1600 CC) recorded the highest participation. The fastest event of the meet was the SL-GT cars up to 3500 CC event, where both Darin Weerasinghe and Ashan Silva showed how to handle these super-fast monstrous vehicles on winding and climbing terrain. Ashan Silva made it 4 milliseconds faster than Darin and was able to bag the trophies-for fastest driver and the best timing for the day. 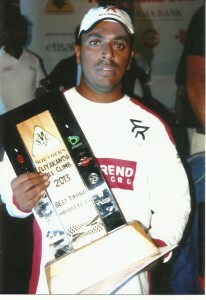 Ashan Silva with his fourth Eliyakanda Hill Climb trophy.